Lee was a man with many characteristics: reliable…irreverent…practical…impatient…humorous…genuine…and quick with a comeback. He was salty and smiling – at the same time. 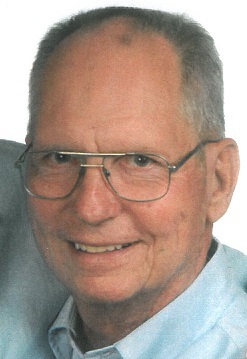 Lee Hellweg died Friday, October 19, 2018 at Jamestown Nursing and Rehab in Rogers, Arkansas. Leland Paul Hellweg (or “Lee” as he preferred) was born at a home in St. Louis, MO on October 16, 1933 to Carl Hellweg and Helena Knoernschild, both deceased. Lee grew up in St. Louis with brother, Dennis (deceased) and sister, Dolores. While at Beaumont High School, he became an Expert Rifleman. He also joined the Central Rowing Club based at the Mississippi River, keeping his 6’2” frame down to 135 pounds. At seventeen he joined the Navy Reserves, stationed at Lambert Field, St. Louis. After graduation, Lee enlisted in the Navy Air Force; boot camp in San Diego, CA., and Advanced Aviation Ordnance School in Jacksonville, FL. He was then stationed at Barbers Point, N.A.S, Oahu, Territory of Hawaii, where he flew the JD-1 (Jig-Dog) and the TBM (Turkey Bird). “One of the best times of my life was spent in the Navy—and fighting the battle of Waikiki Beach.” He was discharged from the service August, 1954. Arranged by mutual friends in May, 1951, Lee met Helen Morris on a blind date. During his four years in the Navy, Lee and Helen (aka, Bunny) spent “Maybe a month together, total.” They were married on September 11, 1954. “Nine months and 15 minutes later” their first son, Steve was born. By this time Lee had started night school at Washington University in St. Louis. During the next nine years, two more sons...Kurt...and Eric 'Duke' were born. Lee graduated in 1963 with an Electrical Engineering Degree. Daughter Kris was born in 1964. The Hellweg family’s yearly vacations were spent camping. Over the years, during memorable weeks, they traveled to Canada, Michigan’s Upper Peninsula, Nova Scotia, the Smokey Mountains, Maine and the Rocky Mountains, eating Lee’s spaghetti and enjoying the twilight and s’mores. And falling asleep listening to Whippoorwills. Lee spent 19 years with Moloney Electric Company of St. Louis, joining the sales force and transferring first to Lombard, IL., and then to Bethel Park, PA. During those years, he enjoyed being a Little League baseball coach and Scout Master. He was a HAM radio operator on 6 meters with the ‘Crystal Cookers Society.' Lee then joined McGraw-Edison Company which later became Cooper Industries, and the family moved to Omaha, NE. When he became Regional Sales Manager, the family moved to Naperville, IL. In 1996, Lee and Bunny retired to Rogers, AR. Lee loved to hunt. He also took his Tracker Ranger out on Beaver Lake. As Lee fished, Bunny sketched. With Bunny, his wife of 64 years, he leaves behind a legacy of families: children, Steve (wife Jen), Duke (wife Ronnie), Kurt (wife Sherry) and Kris Hogan; grandchildren, Tyler Hellweg (wife Kate), Melissa Hellweg, Erin Donastasio (husband Cody), Kelsey High (husband Chad), Randi Hogan and Samantha Hogan; great grandchildren, Kayla and Jayden Hellweg, Olyvia, Gabriella and Liam Donastasio, Holden and Everett Hellweg, and Raylan and Brynlee High; and of course his sister, Dolores, with whom he shared a childhood of teasing and memories. We honor our fun loving cousins (remember, Branson?) and many countrywide friends. Lee was a man who laughed, who enjoyed his grandchildren, who taught them to eat kippers out of a can and who cooked up bags of peanut brittle each Christmas for family and friends; a man who had a lifetime of practical knowledge... and was willing to share. Lee: keeping his head up. Eyes on the skies. What a guy. We love you. Memorial Service will be held at 2:30pm, Saturday, October 27, 2018 at Stockdale-Moody Funeral Services in Rogers. Visitation will be held at 1:30pm until service time.